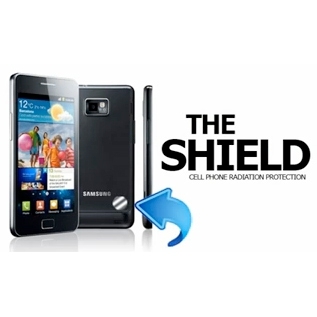 The Shield is a small stick-on attachment you can place on your cell phone, tablet, computer, TV, microwave, or any other device in your environment that emits EMFs. While no device can block 100 percent of EMF radiation, this device is intended to help filter EMFs in an effort to reduce their negative effects on the human body. Electromagnetic fields, or EMFs, can be produced by many electronic devices, including cell phones, computers, tablets, and microwaves. There’s been a great deal of concern about the effects of these EMFs on the human body, especially with the prevalance of ever-evolving technology, and when cell phones are held close to the head and portable computers and tablets are used directly on the lap. Even though nobody can definitively state just how widespread and serious the effects of these EMFs are on the human body, studies have shown that the presence of EMFs can have a negative influence on the immune reactivity of an organism. Thus, concern over the impact of EMFs on your own life is normal. Taking steps toward minimizing any potential risks posed by EMFs is a smart element of your continuing efforts to achieve a healthy and fulfilling lifestyle. That’s why we offer the Shield. Use of the Shield, in addition to following other sensible EMF-reducing measures, can help limit your exposure to potentially harmful EMFs. Each package contains 3 separate Shield attachments. We recommend that you place one on each device that’s causing you to have EMF-related concerns. • Use a headset whenever possible when using your cellphone. • Place your laptop or tablet on a counter, desk, or table, or if you’re reclining, on a lap desk or pillow. • Sit as far away as you comfortably can while using any electronic device, including desktop computers and TVs, and stand as far away as you can while using a microwave oven. Remember, no device can deflect 100 percent of EMFs. That’s why it’s important that you adopt an overall approach to emissions from electronic devices that minimizes your close contact with them. The Shield isn’t meant to encourage you to—nor does it make it safer for you to—increase your EMF exposure. Instead, the Shield is intended to help combat the EMF exposure you’re currently experiencing. Each package contains 3 stick-on attachments.